Pennisetum messiacum ‘Red Bunny Tails‘ adds constant movement to your gardens and containers with it’s fluffy burgundy red plumes that blow gently in the breeze. The burgundy green foliage stands 18’36” tall and grows best in the full sun. ‘Red bunny Tails’ is a tender perennial grass (zone 7-11). This drought tolerant grass would make a wonderful addition to your garden. (Hakone Grass) Hakonechloa ‘All Gold’ is a new dwarf form of Japanese forest grass that creates an appealing bright spot in the shady or woodland garden. The bamboo-like leaves are bright gold in part sun and more chartreuse in full shade. In the cooler days of Autumn, the leaves have a reddish inflorescence. The gracefully arching foliage is slightly more upright than the more common Hakonechloa ‘Aureola‘. Prefers fertile, moist, well-drained soil. ‘All Gold’ looks spectacular with blue-leaved hostas! (Fountain Grass) Pennisetum ‘Fireworks‘ is a refreshing new look to an old time favorite ornamental grass! ‘Fireworks‘ is the first variegated purple fountain grass. Each leaf includes various shades of pink, burgundy and purple with a little white thrown in for contrast. Since ‘Fireworks’ is a sport of Pennisetum ‘Rubrum‘, it will also look great as a center piece in combination containers. 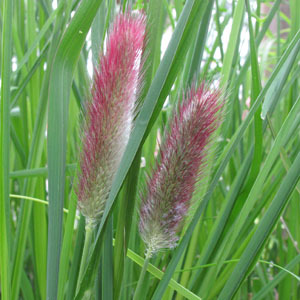 In the garden or landscape, plant it with red or purple plants such as Pennisetum ‘Princess’ PP17,728. If you are looking for a grass that takes on different colors as the seasons change, be sure to check out Carex Orange Sedge. This relatively short grass, standing only 12-24 inches tall is great for borders, or make a large statement and plant in masses. 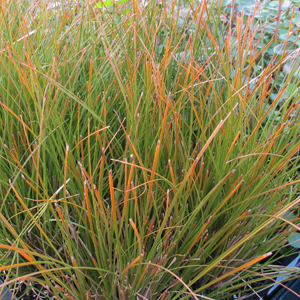 (Orange Sedge Grass) Carex testacea features finely textured and gracefully arching olive-colored foliage. In the fall, the foliage takes on a coppery-orange color that is simply stunning and continues through winter! Looks magnificent in borders, containers, or cascading over walls. Carex testacea prefers moist soil and sun to part shade.